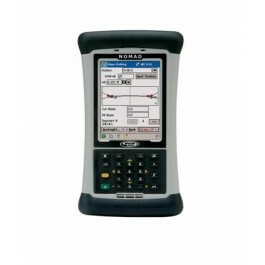 The Spectra Nomad 900LD Data Collector with Layout Pro Field Software is a powerful handheld computer for surveying that enables you to take CAD (Computer Aided Design) drawings from office to field. This device is highly portable and lets you layout design plans even in poor field conditions. A data collector is an electronic device that records precise measurements of coordinates, angles, distances, elevations and more. It is equipped with a microprocessor, internal memory for data storage and wireless capabilities for data transfer. This Nomad 900LD Data Collector is the only Spectra Nomad with Layout Pro Field Software onboard. It features a high-resolution touch-screen display that is visible even in bright sunlight. The survey device has built-in Wi-Fi and Bluetooth for transmitting field data wirelessly to a PC and connecting with sensors and total stations. This topographic field computer also has an integrated GPS system and a 5-megapixel camera. The field controller is equipped with a Windows Mobile 6.1 operating system that runs a variety of applications, such as Internet Explorer and Microsoft Office. It also includes Microsoft ActiveSync for synchronizing with your PC. This field surveying data collector has a high speed 806 MHz processor and 128 MB RAM. It also features 1 GB of internal Flash storage that can retain stored information when the device is turned off or loses external power. The Nomad 900LD Data Collector comes with Spectra Layout Pro Field software, which enables you to carry, manage, work with, and lay out jobsite blueprints in the field. The onboard surveying software has a simple user interface, design updates and advanced field applications. With its IP-68 rating, this field surveying instrument has the ability to withstand sand or dust for at least 8 hours and has the highest waterproof rating available with immersion in up to 3.3 feet for 30 minutes. It also meets military standards for drops, vibration, humidity, altitude and extreme temperatures. This portable data collector comes with a 5200 mAh rechargeable lithium-ion battery that lasts up to 15 hours. This Spectra data collector and software package includes a nylon carry case, stylus pen and lanyard, USB cable, hand strap, two screen protectors, rechargeable battery, AC charger and 1-year manufacturer’s warranty. The Spectra Nomad 900LD Data Collector is the only data collector that comes with Layout Pro Field Software built-in to increase productivity and accuracy in collecting survey data. Its powerful features and reliable field software makes this advanced method of data collection essential to any survey project.